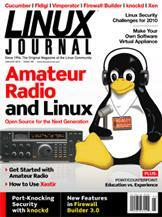 A getting-started guide for Linux users looking to venture into the world of Amateur Radio. Plotting Mars Rover locations on a detailed map, easily done with Linux? You bet! Amateur Radio and open source—a heavenly match. Get GUIed and forget about iptables and its brethren. They can't get in if they can't find the door. Appliances, not just in the kitchen anymore.